Union Minister Nitin Gadkari took a jibe at Congress leader Digvijaya Singh in Lok Sabha today. NEW DELHI: Congress leader Digvijaya Singh has been the target of many attacks for losing Goa to the BJP though the party had emerged as the single largest party in the elections. One more dart was hurled at him on Friday, this time by Union Transport Minister Nitin Gadkari. A senior BJP leader, Mr Gadkari was credited with quickly stitching up the BJP's alliance in Goa and snatching the state from the Congress that took too long to make up its mind on its alliances, and at one time, came close to losing its legislators too. 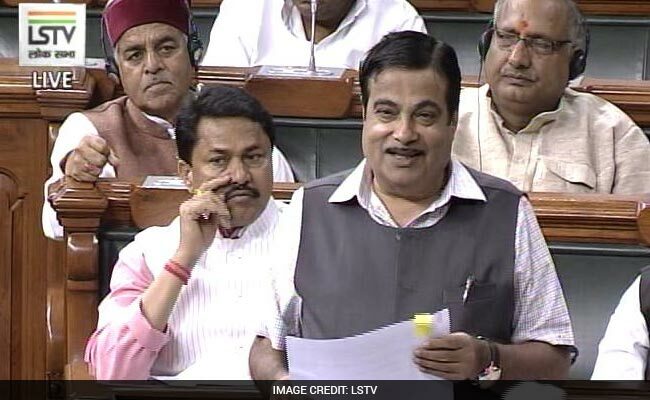 Friday's jibe from Mr Gadkari, 59, came in the Lok Sabha when lawmakers were debating an overhaul to the motor vehicles law piloted by the minister who hopes it would help halve the 1.4 lakh deaths in road accidents annually. Congress member KC Venugopal had just ended his speech on the bill when Mallikarjun Kharge, his party's leader in the House, butted in. "Nitin Gadkari is performing so well. But there is no one. There is no support for him," Mr Kharge said, an oblique reference to the absence of many BJP lawmakers during the debate. Mr Venugopal chipped, referring to the minister's role as the "villain" in Goa. Not one to be outwitted, Mr Gadkari broke into a smile and shot back: "Why you are blaming me? Your hero had slept through the night ... Your film would have run if your hero had not slept through the night," retorted Gadkari. The BJP had won just 13 of the 40 seats in the state against the Congress 17. The Congress also moved the Supreme Court to prevent Manohar Parrikar, who quit as Union Defence Minister to return to Goa, from taking oath. The court did not stop Mr Parrikar from taking charge but told him to quickly prove his majority in the assembly. He did. Mr Venugopal, the 54-year-old lawmaker from Alappuzha in Kerala, whose 'villain' remark provoked the repartee from the Union Minister, had assisted Digvijaya Singh script the party's strategy before, and after the Goa polls. But it was Mr Singh, the senior of the two, who was the face of the Congress leadership in the state and bore the brunt of the attacks. Just last week, Goa Chief Minister Manohar Parrikar had thanked Mr Singh during his farewell speech in the Rajya Sabha, saying the BJP could form the government only because Mr Singh did nothing. The Congress leader had later responded on Twitter with his "Shame on you" comment, accusing the BJP of cheating the people of Goa and demanding an apology.